Founded by a real-life mother/daughter duo, Mimi and Mademoiselle, becauseisayso.com is the ultimate online resource for anyone who wants to enhance their lives with contemporary living advice on all things synonymous with gracious living or being the best you can be. Mimi is a “lady who lunches”. She has a unique perspective and practical sensibility for good and gracious living offered with a bit of wit and lots of wisdom. Mimi is a college and law school graduate, raising three children, including Mademoiselle, and along with her husband, the Modern Day Courtier, is a successful education and media entrepreneur. She is the Co-Founder and Editor of becauseisayso.com. Mademoiselle is an accomplished tastemaker with a more modern perspective to Mimi’s mature sensibilities and a fresh take on all current issues. Mademoiselle is presently attending graduate school, giving her a unique and practical perspective on living well in today’s diverse and constantly changing social culture. She is the inspiration behind, Co-Founder and Editor of becauseisayso.com. 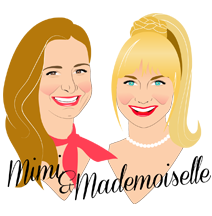 Mimi and Mademoiselle hope to provide today’s woman (and the occasional man) with a different balance of information, entertainment, advice, wisdom and lots of humor. Welcome to Because I Say So! Mimi and Mademoiselle want to inspire you to live graciously with Joie de vivre! Why?